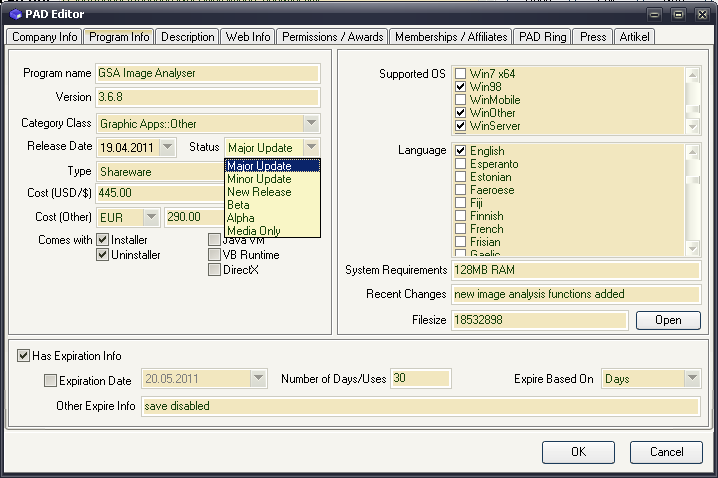 With the PAD Editor you create all the information that is required for a software site to list your software. Fill as much information as possible. Not all fields are required to get filled out, but if you want to make sure that your software gets accepted to many sites, you should try to fill all fields. Very important fields are the all under Program Info, Descriptions and Web Info. Also make sure you add a valid E-Mail under Company Info. You will get a lot E-Mails with verification links you have to click to get the software listed. So leaving these fields empty is not a good idea. And when the final text is generated it can have 3 different sentences in this example. But you can only use this only in the three areas mentioned above as the pad file specification doesn't allow you to use it elsewhere. You should upload the PAD file to your server once you are done with the PAD creating/editing. This is important as some sites will just need the PAD-URL and nothing else. 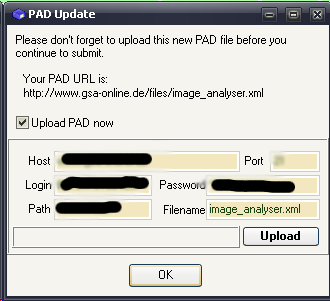 If that PAD file is not updated online, the software will not get updated on those sites as well.